During our spring road trip to Utah Rocco spent hours chasing around in the desert. Upon our return, I’ve noticed some stiffness in his hips and a general lack of energy. 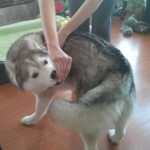 I was worried that he might be developing hip-dysplasia, but after a vet consult and a series of x-rays and ultrasounds we found out that he had a chronic injury in both his groin tendons which caused symptoms similar to hip dysplasia and due to compensation, he developed medial shoulder instability (MSI) in his left shoulder. On top of that the ex-rays showed mild surpraspinatus tendenopaty in his right shoulder, so basically he was injured in all four corners…It was a huge blow, especially since there were absolutely no prior signs indicating the extent of his problems. 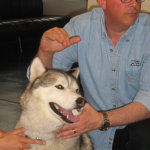 We are extremely lucky to live close to a board certified sports medicine veterinarian, Dr. Lane, who has been absolutely phenomenal throughout this whole process. The initial prognosis was rather guarded: 4-6 weeks in a hobble vest, 4 months of rest with likelihood of surgery if the rehab process doesn’t yield satisfactory results. So in other words, to avoid a costly and invasive stems cell surgery we had to follow the conservative treatment plan as closely as possible. HA! We tried. He was only allowed 15min walks on flat surface. Absolutely no downhill, down the stairs or jumping, nothing that would put pressure on his shoulders. Well, we live on third floor with no elevators, so the only option was carrying him down the stairs (25 kg) at least 3-4 times a day potentially resulting in injury to both dog and human, or teaching him to walk down very slowly and carefully with a support sling to take off some of the pressure. Since we weren’t allowed walks, we spent time hanging out in parks, watching the world go by. Needless to say during each recheck I felt like complete failure with incidents of running down the stairs, unauthorized zoomies or unfortunate slips (even though the whole apartment was covered in runners and yoga mats). It truly seemed like a never ending summer of short leashed walks, constant fretting, frustration for both human and canine and endless worrying that I’m not careful enough, vigilant enough, pro-active enough….. Turns out the healing process was coming along quite well with only a minor set back (a seizure in August threw out his back) and by September we were cleared for a gradual return to normal activity. 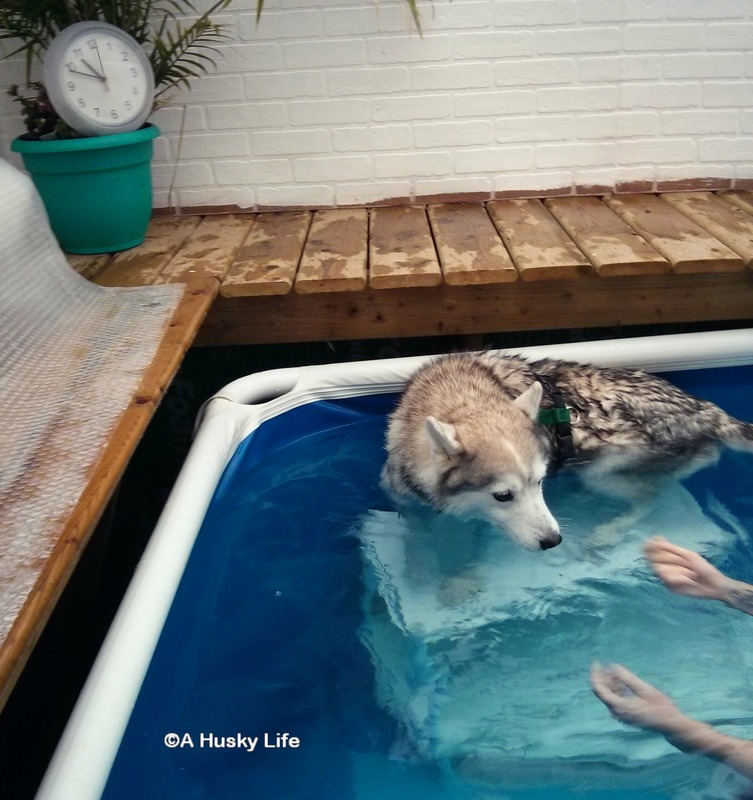 We decided to go ahead with a physiotherapy plan to slowly build up his stamina, muscle mass and body awareness to give him the best chance of preventing re-injury. 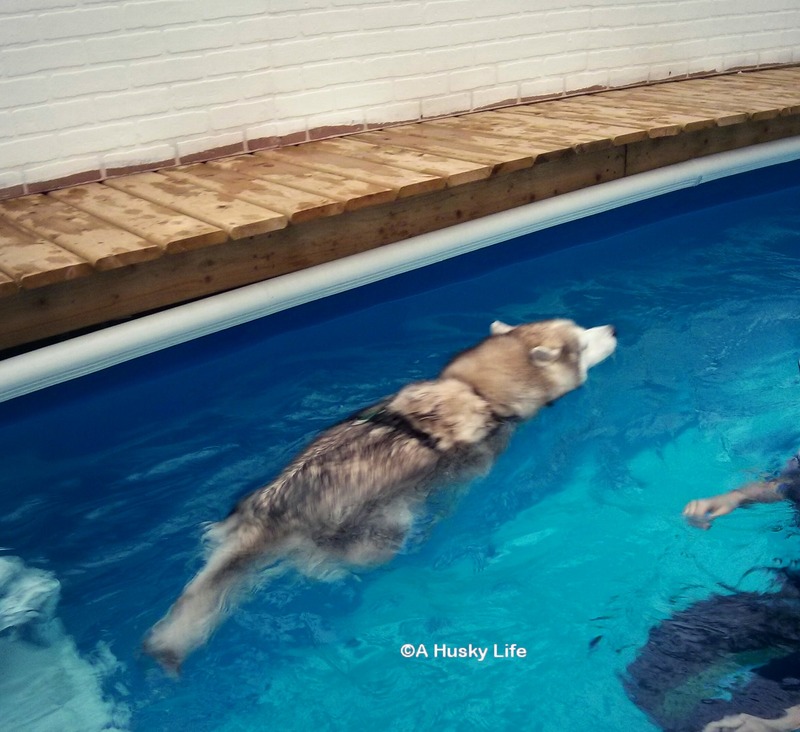 Jenn Panko from The Spaw has been a wealth of experience and knowledge and took us through underwater treadmill, laser and Toto Fit exercises to build Rocco up to the point where he can safely romp around off leash. 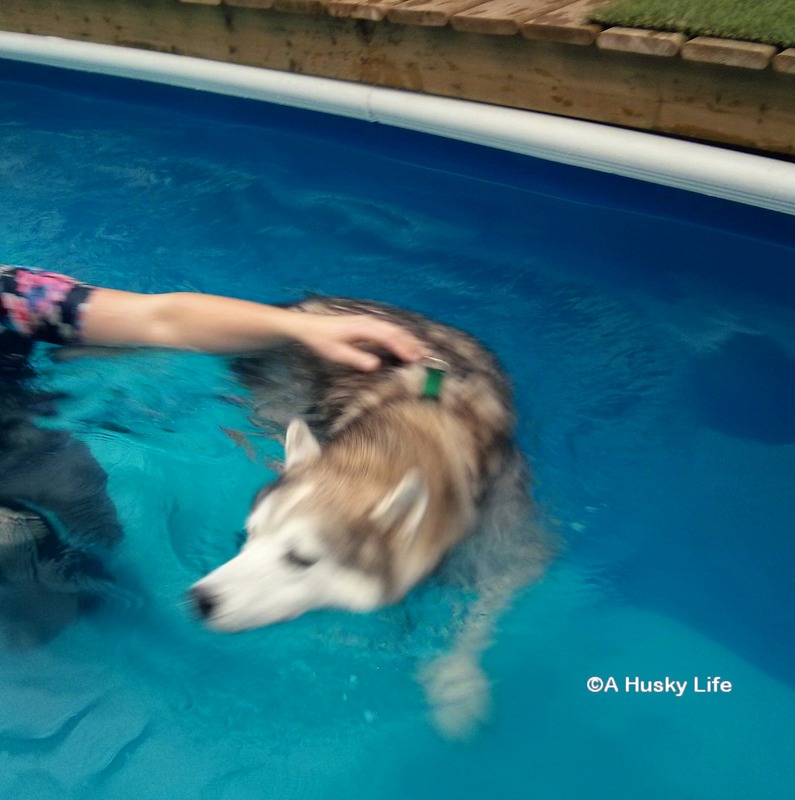 He was also cleared for swimming, but even though Rocco loves to swim in the ocean, river or lake….he wasn’t too thrilled when we signed him up for weekly swim sessions in a warm water therapy pool. Five months later he finally got to go on his first off leash flat trail and he was absolutely ecstatic. 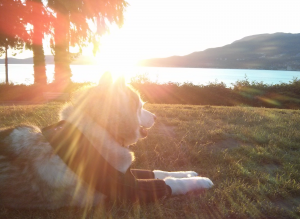 We slowly increased the duration and difficulty of his walks getting back to our regular 1.5 -2h varied terrain walks or 45min-1h off leash runs. And then we hit another set back. Turns out that his body was not used to moving “properly” and his right SI joint “jammed up”. After yet another visit to Dr. Lane we cautiously got back to our regular activities. 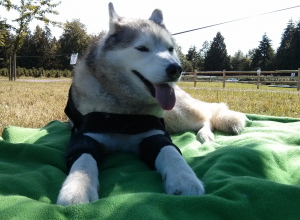 It’s been a long and frustrating six months, however, with the help of Rocco’s amazing vet and rehab team we have successfully completed the rehab process and our 8 year old dog is playing like a puppy. 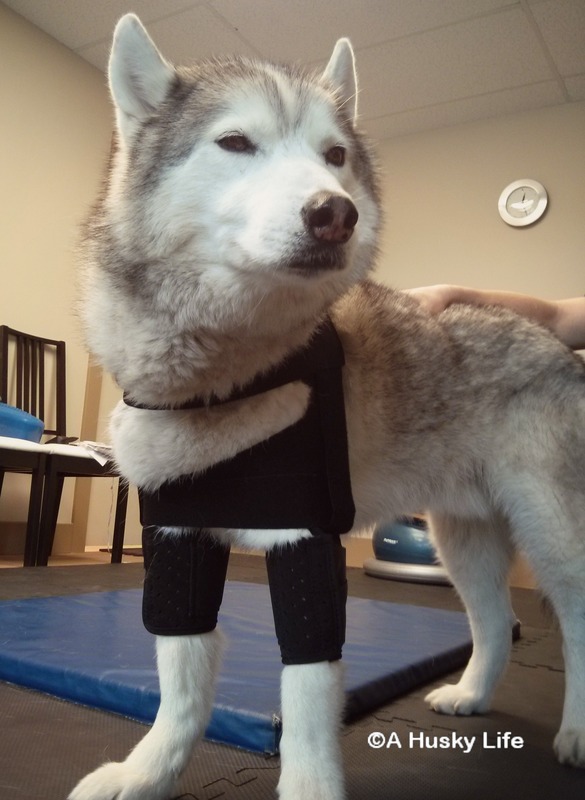 I have been a part of a rehab team for many dogs recovering from various injuries, it’s rewarding being able to use my skills and knowledge to assist these dogs in regaining mobility. It’s just as rewarding being able to support their guardians throughout an often stressful and frustrating process. However, when it came to rehabbing my own dog, well, that’s a completely different story! Suddenly being objective and rational was an impossible feat, years of training and experience went out the window, replaced by an emotional roller coaster of fear, guilt, denial and hope. Just like that, I was experiencing the rehab process from the other side and I didn’t like it one little bit. However, as most things that make us feel uncomfortable, scared, overwhelmed or confused this experience forced me to grow and learn. It has taught me invaluable lessons that, without doubt, will help me better serve my clients. Be patient with yourself, you’re doing your best and it’s OK to get frustrated and overwhelmed. Sometimes Plan A doesn’t work and you have to get creative and come up with plan B, C….D…..
Trust your vet, they are on your side and have your dog’s best interest at heart. If you don’t trust them, find a new vet. Be honest with your vet – they are not there to judge and every detail might be important to the treatment plan. Advocate for your dog. Sometimes we get caught up on how the rehab should be progressing, but we have to remember that each case is different. Speak up for your dog and voice your concerns. It takes time….a long time, don’t rush the process. Patience is your friend, trying to rush things along can cause more damage. The rehab process is not a straight line from A to B, there can be setbacks, there can be unexpected discoveries, adjustments might need to be made to the treatment. Research, ask questions, educate yourself on your dogs condition. 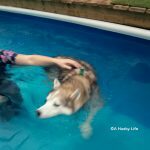 It will empower you to better advocate for your dog and it might take away some of the anxiety and fear of the unknown. 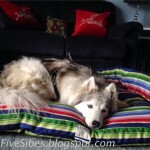 Dogs are experts at hiding symptoms. Don’t overlook even the slightest change, it might be pointing to a larger issue. Keep a detailed a log of the rehab process, videos can be very helpful to keep track of the progress. 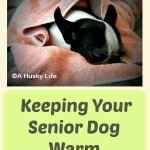 There will be many restrictions on your dog’s activity, find new ways of having fun and spending quality time together. It can be simple brain games, nose work, hanging out at the park and enjoying a healthy snack. Make the time count. Thanks for this article. Where did you find such a vest? I’ve been looking, see it online, but haven’t been able to find out where to purchase. So glad your dog got better. From reading your article, me and my dog have a long long road to travel. Thanks for sharing ! If you can email me as to where you purchased, I w/appreciate.